I love Mexican food, I can’t get enough of it. When I moved to California for grad school, I learned to cook authentic Mexican food (I’ve finally learned what a real taco is). That being said, I don’t make the sauce from scratch in this recipe. Using a jar of salsa verde really cuts down on the prep time and still tastes wonderful. Make sure you buy a quality brand of salsa, don’t skimp on this part. But if you’ve got the time and ingredients, I recommend making your own salsa verde by following Elise’s Chile Verde recipe. 1. Preheat a large pot to high. Add pork and brown on all sides, about 4-5 minutes. Drain excess liquid and place the meat in a bowl on the side. Stovetop method: Add the meat, oregano and cloves to the pot and cook for another minute. Dump in the salsa and chicken broth and bring to a boil. Reduce heat to low and simmer for 1 1/2 to 2 hours, until meat is very tender. Using turkey tenderloin takes about 1 1/2 hours and lean pork will take closer to 2 hours. Crockpot method: Add all ingredients to the crockpot and stir until mixed. Cook on high for 3-4 hours and then on low for an additional 2-3 hours. 3. Serve with a dollop of sour cream, cheddar cheese and Homemade Tortilla Chips, for dipping. Depending on the brand of salsa, this dish can be very spicy. Make sure you taste the salsa first! Nick, you know I love you and all – but I have to say that the cover photo looks a little bit like sick. Don’t hate me ok, I speak as I find, I’m sure it tastes just fantastic. I looove Mexican dishes – so comforting! This looks fabulous. I love Mexican food! I adore chili verde–that looks fantastic! And if you go to Trader Joe’s, which I assume you do, since you said you love their PB, they have a great salsa verde, too. Naomi, point taken! I switched the first and last photos. At least by putting the offending one at the end, at least it’s in order of cooking so it doesn’t look as sickly =). grace, veggiegirl, Amanda, I agree, something about Mexican food that is so simple yet outstanding! I truly can’t get enough of the stuff! elle, thanks for the tip, I didn’t know TJ’s had salsa verde. I’m heading there today so I’m gonna get some for my next batch! Thanks! Oh, Nick, where to begin? I love tomatillos and salsa verde; my favorite brand of the latter is made by Desert Pepper (which, I think, is a lovely and poetic name for a salsa company!). This recipe reminds me of several recipes that I have tried and loved, but I have yet to decide if they are blog-worthy. I adapted a Rachael Ray recipe for green chili; my version is vegetarian, but I have yet to get the spices right, so I have to work on that. Another recipe comes from The Cornbread Gospels by Crescent Dragonwagon; basically it involves opening cans and perhaps a tiny bit of chopping, so it’s good for those days when you want a big pot of something (perhaps to cover dinner and lunch the next day?) but have very little time to cook. But OH! Those tomatillos! Makes me wish I had time and room for a second dinner tonight! This was really delicious even though it was too spicy for me. I haven’t been able to find a “mild” salsa verde. Is there such a thing? I had it with pork tenderloin. I can’t wait to try it with turkey. rosiecat, Those people at Desert Pepper really know how to make a salsa. I’ve never had their salsa verde though, in fact I’d never really had salsa verde at all until I decided to make this. But now that I have, I’m addicted! I love those days when you’ve got like 10 cans of stuff you can just open and pour into a pot. Add some onions and garlic and you’ve got a wonderful pot of chili! I just picked up TJ’s salsa verde because of a recommendation from Elle. I can’t wait to try it out! I cut the recipe way down and combined it with another recipe that a friend had given me…here it is..1/2 cup sugar, 1/2 cup brown sugar, 1 cup peanut butter, 1tsp. GF vanilla, 1 egg..and don’t ask me why, but I had buttermilk in the fridge so I added 1 tablespoon. Baked them exactly as you do, and they came out fabulous. I thought it was a fluke, so I mixed up another batch & they were good too! I even had them for breakfast a couple of mornings! LOL! The chili verde looks good, but it may be a bit spicy for me (but I will try it!..I’m fixing it for my husband, he’ll love I’m sure! Thanks for recommending this recipe. Can’t wait to try it! mmm peanut butter! do you really consume 1/4 a jar per day? do you just take tiny spoonfuls? I find sometimes I need a fingerful to end my meals…otherwise something just feels off. That chile verde looks awesome! I’m a newbie to your site but the comment that you made that Mexican cooking doesn’t have peanut butter is incorrect. Have you ever heard of “Mole”? It is a sauce that is made with chocolate (and that I find disgusting) and then poured over chicken or meat but I don’t like a sweet taste with my meats. My family makes their mole with, you guessed it, Peanut Butter! The sauce is savory and absolutely delicious. You can’t “taste” the pb per se but you definitely need it to make the sauce. I don’t have a recipe for you (I’m not the cook in our family) but you might be able to find something from the internet or maybe from Elise Bauer. p.s. 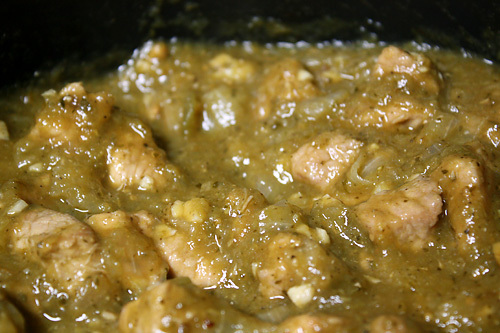 Your chile verde looks pretty good! heather, I have not found any Mexican recipes with peanut butter, but maybe I haven’t looked hard enough. I’ve been waiting for some inspiration or a breakthrough but none as of yet. However check out what crazy4shabbychic said above. crazy4shabbychic, I love a good mole sauce. I love chocolate and I think it can be used very well if the mole sauce is made right. I have never heard the use of peanut butter instead, you must find out and divulge this recipe! I need it! I’ll have to email Elise and see if she knows anything about it. Or, I could beg you for it until you cave! Just found this googling ingredients after misplacing my cookbook while shopping. The recipe was for a dip made from salsa verde and peanut butter and hot sauce. The source? Better Homes and Gardens, so take it with a grain of salt, although there were a surprising number of authentic-looking recipes in it. And they did give it a Spanish name instead of calling it Mexican Hat Dance Dip. I added a bit of raw chopped shallots and the juice from a key lime and left it chunky. If you have a really nice salsa verde to start with, you might not need to add anything else, but I was using canned Herdez. And Frank’s. It’s good with corn chips, although I think I overdid the PB, so it was a bit jarring. Maybe just a little PB in a salsa verde would give it an interesting flavour? I love REAL Mexican food! That chili verde looks fantastic…and now I want a steak taco with cilantro and onions! i saw a show about chili verde a few weeks ago and have been wanting to make it for a long time. this sounds really yummy! I love salsa verde. This looks delicious! Mmm, Mexican is one of my favorites. I can’t wait to try this chile verde. It looks AMAZING! wow, you really can’t go wrong with mexican :) fabulous!! Wonderful shot! Looks so mouth-watering! Nick this looks deliciously satisfying and stick-to-the-roof-of-your-mouth peanut-buttery! Will try it! Hopefully using only turkey won’t change too much the texture (don’t eat pork)… maybe I’ll throw some bison in there too, I’ve gotten into it lately! I’m a fool, I’ve come too late to the blogging world to participate in your contest tomorrow!!! But believe you me, you’ll be getting my entry for the next contest for sure-o! Tomatillo salsa is my fav! I’ll be sure to try this one. My knowledge of Mexican cuisine has been woefully neglected. This looks like good stuff! Love the tasty photo. but way to go pbb! to get a great meal! that looks soooooo comforting! might have to make for hubby sometime!!! This looks delectable and easy. I like using jarred products when they help create authentic looking things like this. So excited to see what else you come up with! I recently started a blog of my own, check it out!! I agree, homemade is the way to go. Unfortunately, tomatillos aren’t the easiest vegetable to come by here – I’ll need to visit some Latin grocery stores. Thanks for the recipe! Sounds perfect. One question – I grow cayenne peppers, think those would be a good substitute? They’re not green (they’re red), but I doubt their color would affect the overall greenness of the sauce. I picture caught my eye, it looks really delicious. Printed the recipe and will be making it soon. Can’t wait, thanks for sharing. Thanks Sandra! Let me know what you think! I LOVE chili verde, but don’t have loads of time. I use canned tomatios and add a large can of green chili enchalada sauce (comes in mild, med or hot) to make it creamy and to add more bulk and flavor. works good if you’re pressed for time, and tastes awesome!